Courtesy photo Gov. 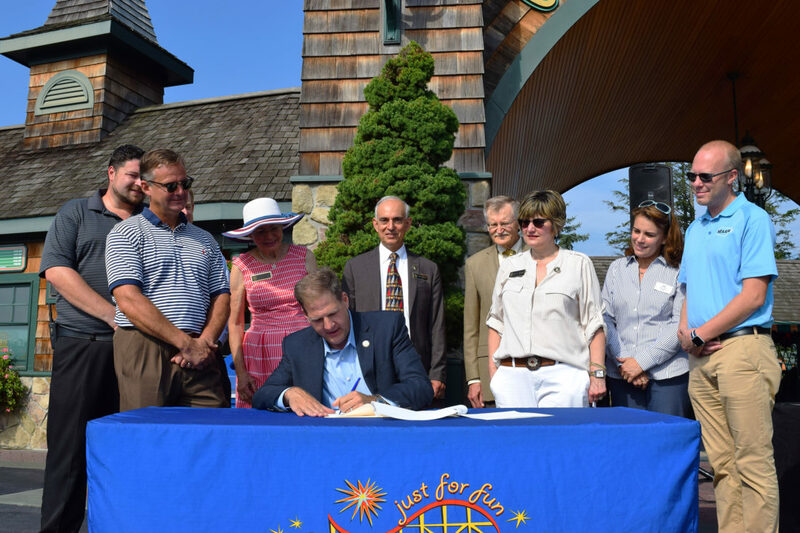 Chris Sununu signs an executive order at Canobie Lake Park in Salem on Tuesday creating a study commission to examine the possibility of delaying the start of the school year until after Labor Day. SALEM – As Nashua School District students endured sweltering heat for the start of class on Tuesday, Gov. Chris Sununu spent part of the day with children and families at Canobie Lake Park. Sununu’s hope is that his Save Our Summers Study Commission will ultimately lead to school districts across New Hampshire waiting until after the Labor Day holiday to send students back to class. Sununu signed an executive order establishing his commission, the members of which will examine the possibility of not starting the school term until after the Labor Day. Most public schools in the state are starting this week. Sununu said New Hampshire’s tourism industry could see a boom from a longer summer, as it would extend the holiday season for families looking to head to the beach, the mountains, or the other areas that draw visitors. “We are a tourism state,” Sununu said. He said the summertime extension could also mean expanding employment opportunities for those in the hospitality industry. “This is an economic issue,” Sununu said. It is not just an issue for the tourism industry, said Matt Peters of Peters’ Farm in Salem. While Sununu said delaying the start of the school year is a popular idea in the state, the concept is already getting mixed reviews in Nashua. During a recent Nashua Board of Education meeting, Teachers’ Union President Adam Marcoux said that to entertain the concept was “ridiculous” and that he personally saw it as a way to get “cheap labor from the high school” students. Nashua Board of Education member Doris Hohensee said it would be “absolutely absurd to even consider it” after the way snow days affected the end of the school year the last two years. The most recent “conversation” about how to make up snow days and when to end school was a process that lasted several months and involved a great deal of ire on all sides.  losing local control of the school calendar. The commission membership has yet to be filled out, but will consist of a state senator, two state representatives, tourism industry representatives, additional business representatives, parents of school children, union officials and academic professionals. The commission has until Nov. 30 to complete a report on its findings. Staff writer Hannah LaClaire contributed to this story.